Whew...is it really Monday again? This weekend flew by in a blur and I am still trying to catch my breath. I hope yours was as fun and non stop as ours! This year we decided not have a formal birthday party for Everett, and we thought it would be fun to pack tons of family and friend activities into his birthday weekend and celebrate him over the course of two days instead of 2 hours. I have to say, it was a blast and he loved every minute of it. Saturday began with a trip to Cocoa Beach with friends. The weather was gorgeous, sunny and 70 degrees, when the sun was out. When the clouds came rolling in it was a bit of a different story, windy, chilly and dreary. Hilty and her friend Jax. There wasn't much water time, but Everett loved playing in the sand all day long and I loved catching up with our friends. A win-win I would say. As soon as we felt a few rain drops we started packing up and headed back to our friends' house for some snacks and adult beverages before turning in for the night. Sunday morning found us up early and at 7:30 am mass...yes, all 4 of us, although E might have just been sleep walking. After mass it was a mad dash home to make cupcakes to take with us to the bowling alley! Everett had never been before and we thought it would be a fun activity for all of our friends and their littles...and it was! I think the adults had as much fun as the kiddos, there were smiles all around (well, except for poor sweet Mason, he didn't love it). We bowled, ate pizza and cupcakes and celebrated our little guy one more time with some of our favorite people. Truth be told, he really just loved to watch the ball return. After bowling, we headed back home where the three kids Mike, E and H all took naps and I headed to the grocery store. I returned 2 1/2 hours later (I made a few other stops, too) to find them all just waking up. Lucky ducks. Then, we had one more quick turnaround to make to head to another party, this time a Super Bowl Party at our friends Ashley and Greg's house. 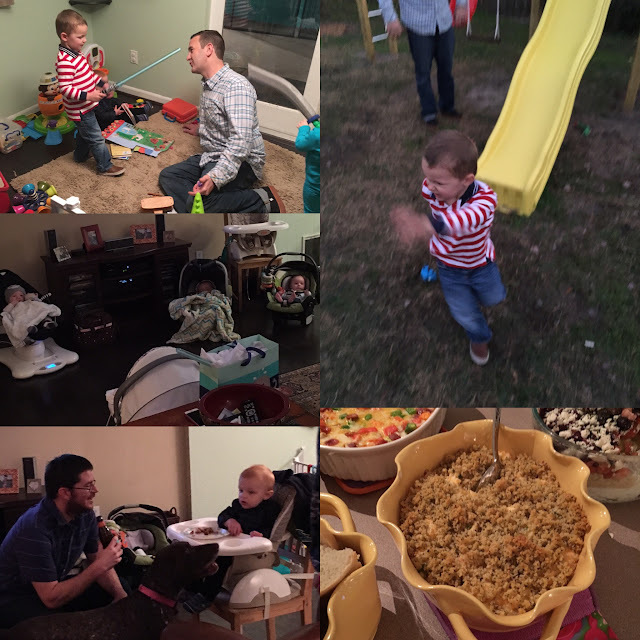 It was baby and toddler central with delicious food and lots of activity. We loved it and we loved the outcome of the game...Go Broncos (for you, Kate!). I made Jalapeno Popper Dip for the party- recipe coming this week! This week should be somewhat back to normal...if there really is a normal. I'm hoping to just catch my breath a little, but I'm not counting on it. We shall see! T: Mike - Sausage Bean Soup , Lane - Dinner with friends!